As we saw in previous chapters, in order to remove or flip layers, you first need to select them. Click on the layer's name, it will be highlighted in green. 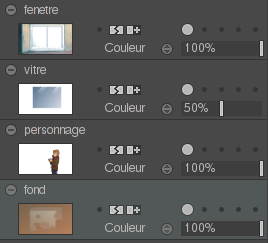 It can be very interesting to select several layers at once. To do so, hold [Ctrl] or [Shift] when clicking. The selected layers will then appear in green. You can also use the contextual layer menu with a right click. This feature is also available in the Layer main menu. The Select group option will be explained in lesson 4. 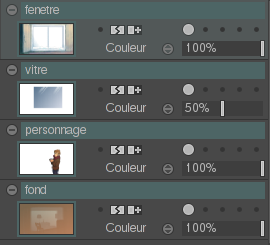 Thanks to this multi-selection, you will be able to add exposures to all layers once, instead of doinf it for every layer.